How do I modify my Auto Attendant Profile? How can I run a Utilization Report? 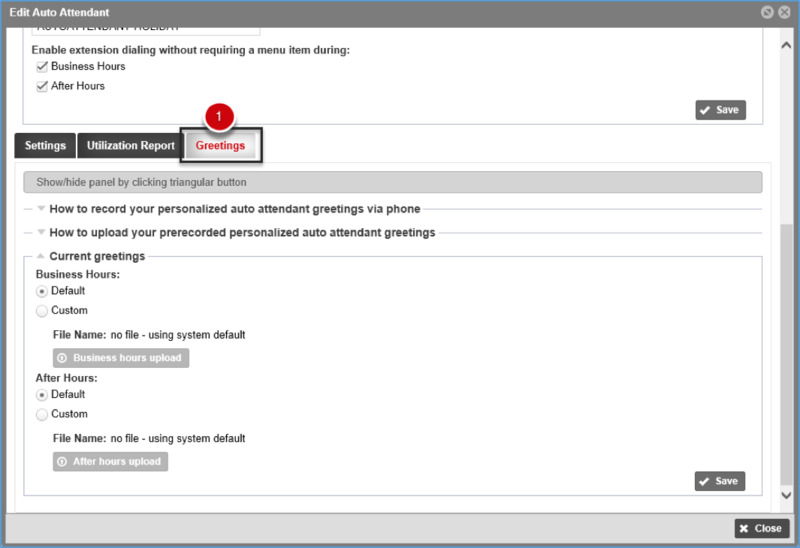 How do I change my Auto Attendant Greeting? To learn how to modify the Time Schedule, please visit the Time Schedules Article. A. What is an Auto Attendant? 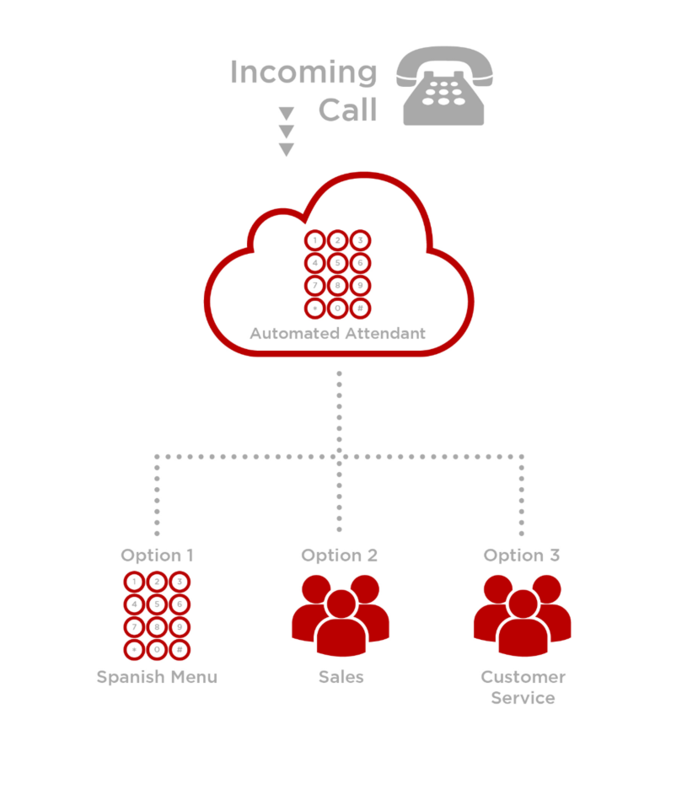 Auto Attendants are used to route calls to various destinations, employees within your company, specific groups of employees, voice mail, or other outside numbers. Your Auto Attendant will provide incoming callers with your company greeting and dialing menu options. Each Auto Attendant is assigned a unique 10-digit number for identification and setup purposes. The Auto Attendant has two modes, one for business hours and the other for after hours. Each mode allows administrators to set up options 1 – 9, #, and * to present callers with different options from which to select. To route callers to another set, or branch of options, an additional Auto Attendant must be assigned to your account. To add an additional Auto Attendant to your account, please contact your site administrator. If you require a unique message, greetings can be uploaded to the My Account portal as a .wav file or recorded from the Voice Portal. B. How do I modify my Auto Attendant Profile? 1. Login to the My Account Portal. 2. Click the My Site tab at the top of the screen. 3. Select a site on the left. The My Site dashboard appears displaying quick links. 5. Click Set Up Auto Attendant. 6. Select the Auto Attendant you want to configure. 8. The Edit Auto Attendant pop-up appears. 9. By default, the phone number assigned to the Auto Attendant displays in the Auto Attendant Name field. You can change the default number by entering a name for your Auto Attendant. Create a name that reflects the purpose of this specific auto attendant (e.g., Main Line Auto Attendant). Note, this phone number may also be a lead number. 10. Modify the Extension assigned to the Auto Attendant, if applicable. 11. 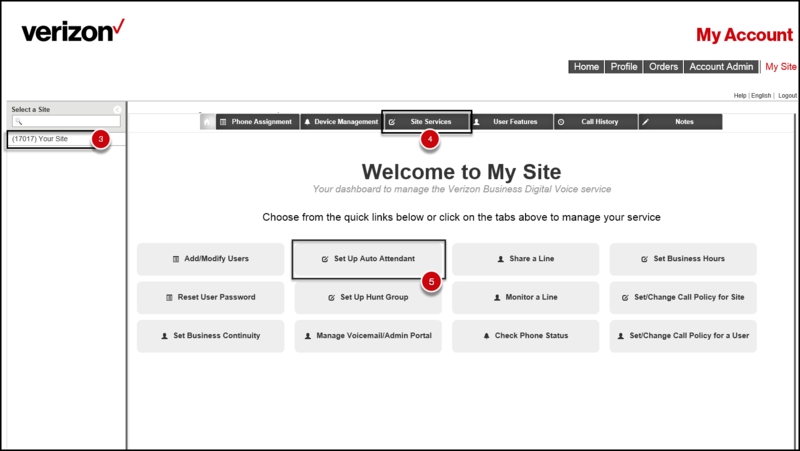 Select a Dialing Options: Enterprise or Site. •	Enterprise – callers who reach the Auto Attendant and choose to dial by name or extension can reach any user at any location within the entire company. •	Site – callers who reach the Auto Attendant and choose to dial by name or extension can reach any user located at the specific site associated with this Auto Attendant. Note: Though the Enterprise option is available, at this time customers only have access to Site Dialing Options. 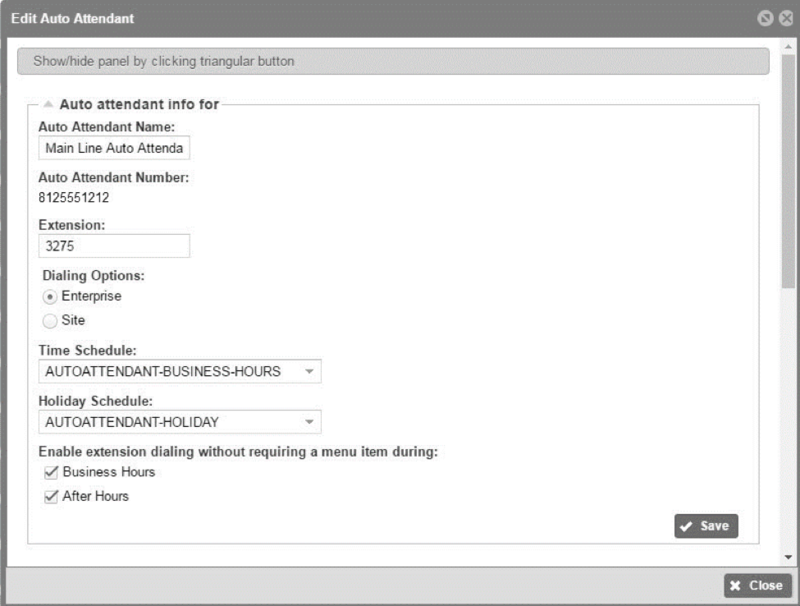 Assign a time schedule to the auto attendant. The selected time schedule determines when callers will hear your greetings. Select Business Hours and/or After Hours to allow callers to reach users by dialing their extension any time during the business hours or after hours time schedule. C. How do I modify the dialing menu for Business Hours and After Hours? 1. Click on the Settings tab to configure the business hours and/or after hours menu and click Edit. Here you will determine which action the Auto Attendant will take when an incoming caller chooses a particular number of symbol on the keypad. 2. Double-click a row to change the settings. The Edit Keypad Settings pop-up appears. The keypad numbers that can be configured include numbers 0-9, star (*) and pound (#). 3. Enter a Description (e.g., Customer Service). 4. 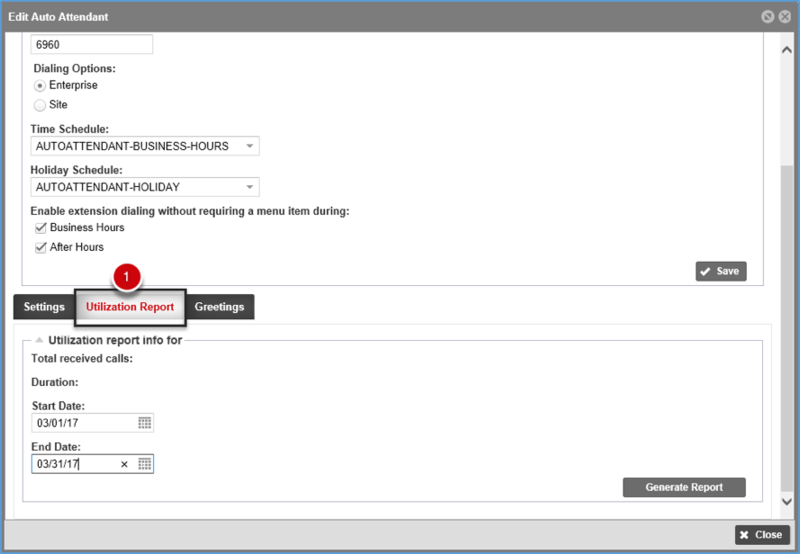 Select the Action for business hours from the drop-down list. Transfer to External Number with Prompt: This action routes callers to a phone number that is not a User or Extension within the company. For example: A third-party answering service or corporate call center. 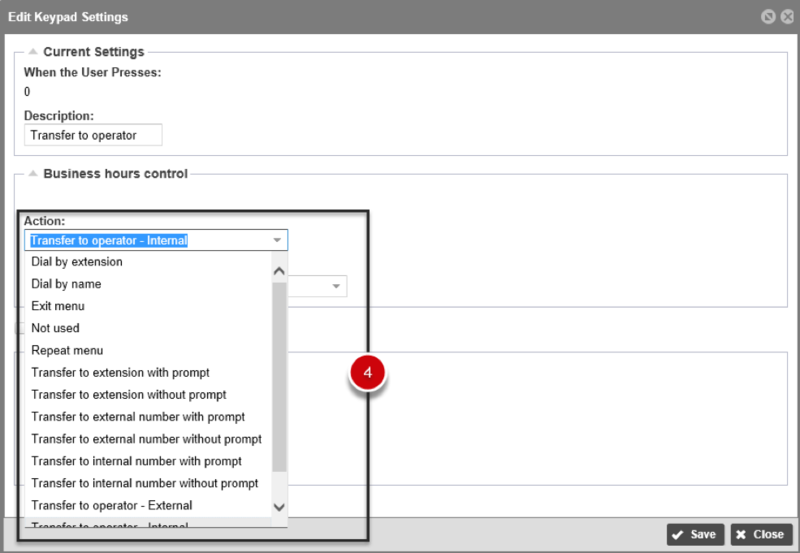 Transfer to External Number without Prompt: This action routes callers to a phone number that is not a User or Extension within the company. For example: A third-party answering service or corporate call center. 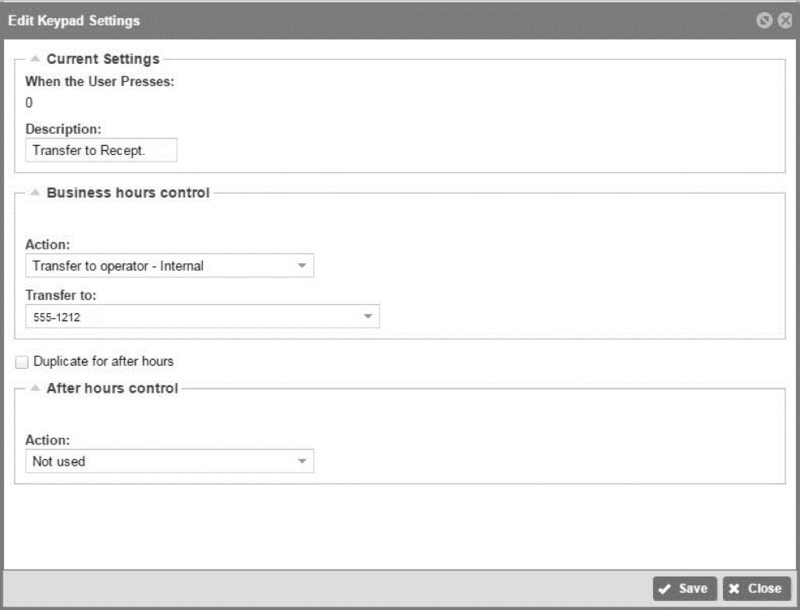 Transfer to Operator – External: This will redirect callers to a configured operator, who will receive all calls that “time out” when a caller does not choose an option from the Auto Attendant. You will enter the phone number to which to route callers here. 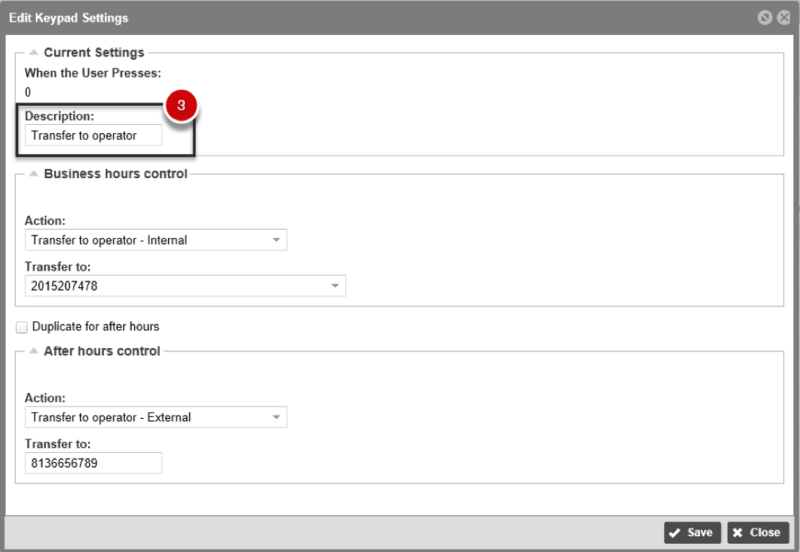 Transfer to Operator – Internal: This will redirect callers to a configured operator, who will receive all calls that “time out” when a caller does not choose an option from the Auto Attendant. You can select from existing phone numbers in the system. Transfer to Voicemail: This selection places callers directly into the Voicemail box of the Extension entered in the “Transfer To” Field. * Where applicable, enter the destination to which the call should be transferred. 5. Check Duplicate for after hours. This will duplicate this keypad’s function during after hours. 6. Select an Action for after-hours control from the drop-down list. D. How do I run a Utilization Report? Auto Attendant utilization reports show the total received calls. 1. Click the Utilization Report tab on the Edit Auto Attendant screen. 2. Select the Start Date and End Date for which you want to view received calls. 3. Click Generate Report. The report information appears at the bottom of the screen. E.	How do I change my Auto Attendant Greeting? Auto Attendant Greetings are used to present callers with options to dial from on the auto attendant. These greeting can be customized and uploaded to the My Account portal, or recorded from the Voice Portal. 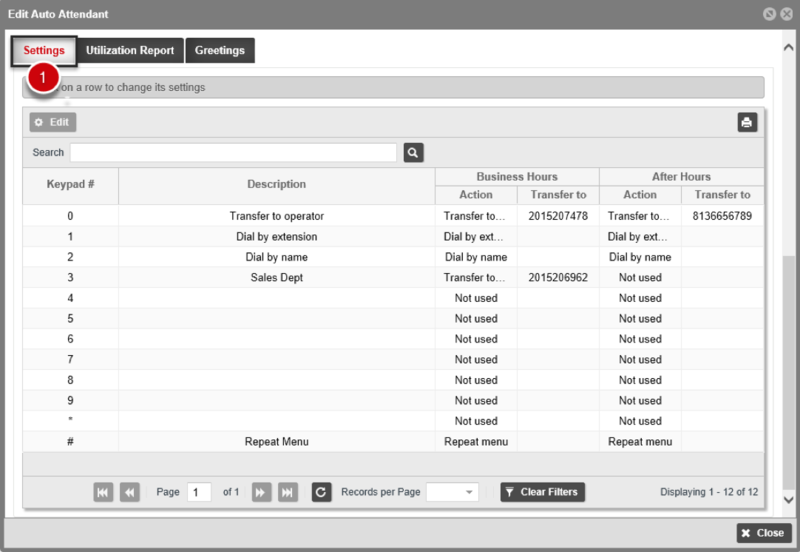 Click the Greeting tab on the Edit Auto Attendant screen. Check Custom to use a custom greeting. Click Business hours upload to upload a custom greeting. For greeting files to properly upload, they must be saved as a .wav file in CCITT u-Law 8.000 kHz, 8 bit Mono attributes with a maximum file size of 2MB. Using a basic sound converter allows you to save your .wav file in this format. Note: We recommend using the BroadSoft Recorder application to record your greetings, and music on hold. Available in the Apple and Android app stores; recordings created with the application can be exported via email. 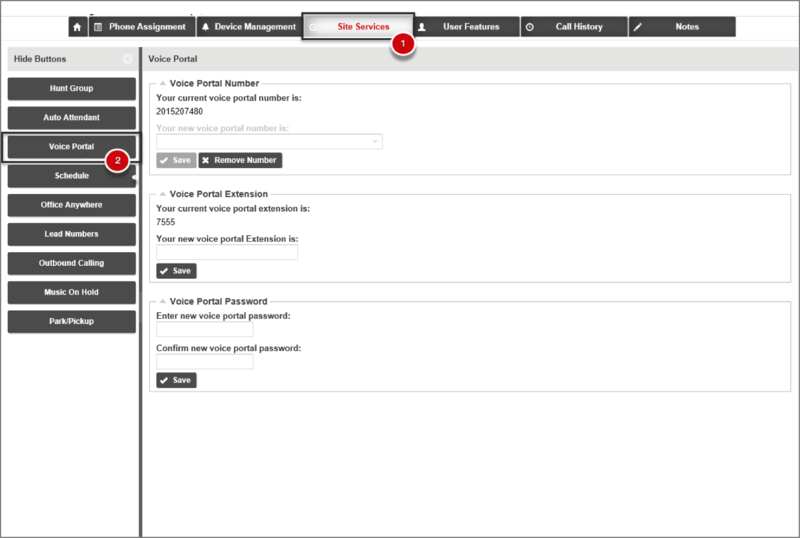 Optionally, you can record you auto attendant greeting by dialing the Voice Portal from any phone. 1. Click the Site Services tab. 2. Click Voice Portal to locate your Voice Portal number and Voice Portal extension. 3. Dial your Voice Portal number. 4. If initially prompted to enter your passcode, press * to return to the enter mail box ID prompt. 5. At the enter mail box ID prompt, enter the Voice Portal extension followed by #. 6. At the enter passcode prompt, enter the Voice Portal administrator passcode followed by #. •	Enter the new Voice Portal password. •	Confirm the new Voice Portal password. 7. Press 1 to change Auto Attendant greetings. 8. Press 1 for Business Hours. Then record the greeting at the prompt. 9. Press 2 for After Hours then record the after hours greeting.